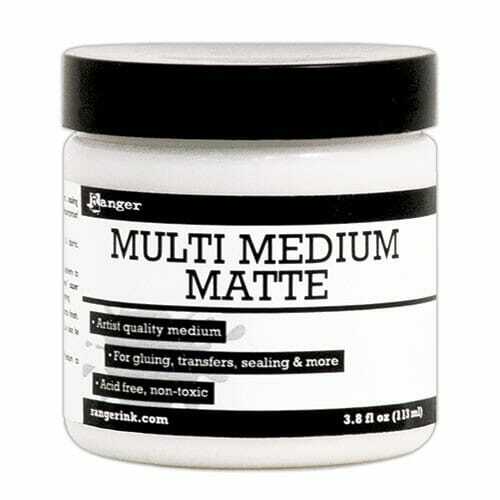 Matte 4 oz Multi Medium. Rangers Multi-Medium is an artist quality acrylic gel medium that can be used as a super strong adhesive, acrylic paint extender or sealer. Use it in many mixed-media techniques including image transfers or resist. Multi Medium is non-yellowing and dries clear. Available in 3 sizes - .5 oz. bottle with needle tip applicator, 1 oz. jars with a convenient built-in brush and 4 oz. jars for larger projects. All sizes are available in Matte and Gloss finishes. Acid-Free, Non-Toxic & Archival. Non-yellowing, dries clear. Customer evaluation for "Ranger Ink - Matte 4 oz Multi Medium"